Dubai Fountain at the center of Downtown Dubai is the world’s largest choreographed fountain system. This system, designed by the California based WET, is built on the waters of the Burj Khalifa Lake. The fountain is 275 meters long and jets water up to a height of 500 feet. The rising water exhibits its dance moves to the tunes of classical, Arabic and latest music. The dancing waters are brightened with 6600 WET super lights and 25 colored projectors that engage the onlookers with a light show creating over 1000 abstract visuals. This illuminated view can be seen not only from 20 miles but also is visible in space. The water showers a total of 22000 gallons of water. 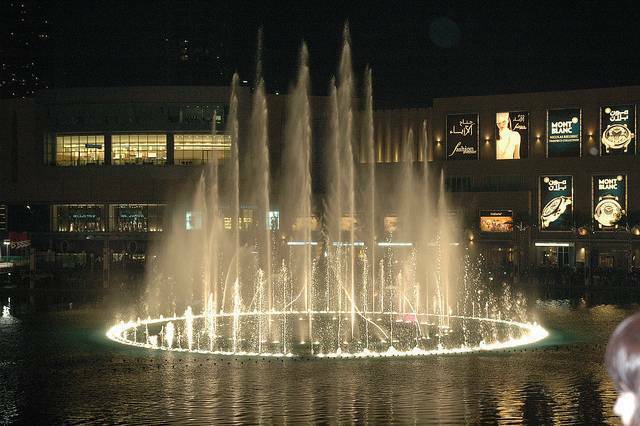 The graceful performance of waters can be viewed from Souk Al Bahar restaurant and the Dubai Mall waterfront terrace. A close up view can be enjoyed from a cruise that starts its sail at 5.45 and continues till 11 pm. The fountain performs to nearly 35 songs daily. Witness this exceptional show of lighting up the entire city and the sky in the evenings.